Hundreds of years in the future, life on earth has ceased to exist as we know it. Humanity’s wastefulness has forced them off the planet entirely, leaving the clean-up in the capable hands of Wall-E’s, robots made by the Buy n Large Mega corporation for the specific purpose of compacting Earth’s garbage in cubes for easy disposal. As the movie opens, there is only one Wall-E left still cleaning up, creating skyscrapers of garbage higher than the skyline of New York City. And this particular Wall-E has developed a strong and adorable sense of curiosity. Every night Wall-E brings a lunch box of “discoveries” home from work; things like rubber duckies, bobble-head dogs, rubix cubes and light blubs. Another thing he finds is a copy of the musical Hello Dolly. There is a song in that movie between the romantic leads, and watching it, Wall-E realizes that he is missing something – someone to love, a hand to hold. EVE arrives on the scene and Wall-E finds that someone. But she is quickly taken back after finishing her mission, to the Axiom, a ship designed as a cruise-liner for displaced humans during the clean-up, and Wall-E goes along for the ride. Originally intended for short 5 year cruises, the humans on the Axiom have been there for a little longer than that – 700 years longer. And it is a depressing sight – humans don’t walk anymore, they ride around in hover-chairs, they don’t even know about recreational activities such as swimming pools and jogging tracks around the ship. And they have no personal contact with each other; they only communicate using the digital screens directly in front of their faces. Wall-E’s arrival on the ship causes things, with both humans and robots alike, to change, little bit by little bit. Now, I’m a sucker for a good Disney/Pixar movie and was excited to see this one at first, until I saw more commercials for it and saw the potential for another “we’re killing the earth” movie. My thoughts immediately were, “Oh great, let’s make a movie that shocks the kids into becoming recycling nuts who can’t leave Seattle for fear of running into a place where they don’t recycle everything. God forbid.” But I was happily proven wrong. 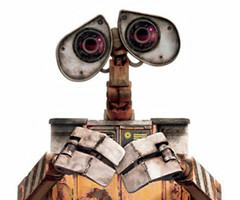 Wall-E is a great movie about an adorably curious and naïve robot and his desire to find love. The idea that “It is not good that the man should be alone” from Genesis 2:18 applies to Wall-E as well as any human concept can apply to an animated robot (but then again, Disney and Pixar have done it with bugs, toys, cars and fish in the past, so I suppose it’s not much of a stretch). Wall-E wants someone to relate to, to be in community with, and to love – he reflects our God-given desire for the same. We’re made in God’s image, and He exists in perfect community in the Trinity, so we desire that. The state of the uninhabitable Earth in the movie didn’t bother me as much as the state of humanity did. A bunch of disconnected, lazy, “happy” humans with everything they’ll ever need to survive who have only ever been connected technologically to each other. There were hundreds of people on the ship, and not one of them had ever had a real, face to face conversation with another. So, I want to challenge all of you to fight against that potential. Go right now, grab your family, and your friends, and go enjoy each other’s company. Why not go see a movie? Say, Wall-E perhaps? I just saw the movie too. Isn’t “Eva” cute? I also just spent the weekend giving pedicures to my family up at Whidbey. My little cousin Sammy (who is 5) just received her first pedicure ever as did my uncle Rick (who is in his 60’s). Sammy was tickled by the pedicure, it was rather cute.